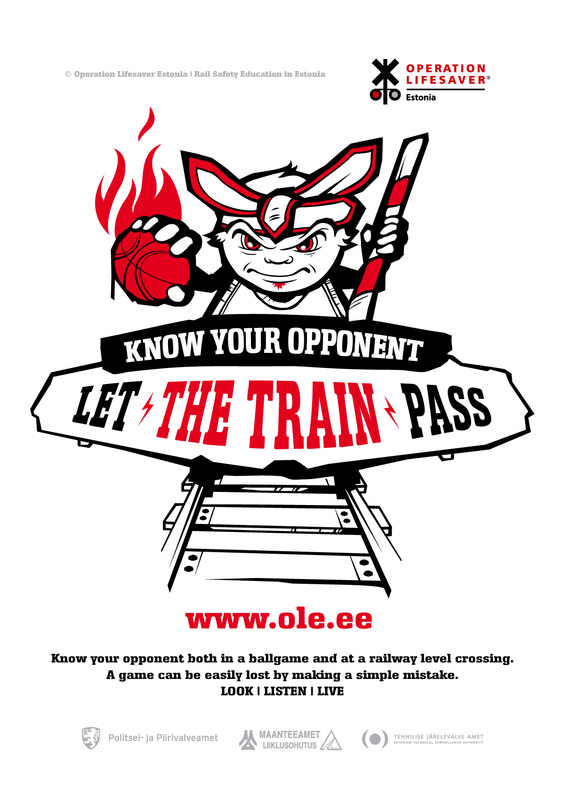 On Monday, April 23, 2012, is launched in Estonia the nation-wide railway safety campaign “Know Your Opponent” that calls on people to notice large vehicles – trains and see them as stronger opponents. The campaign lasts until April 29. If today the freight trains moving around in Estonia can drive up to 90 km/h and their total weight may reach 5500 tonnes then the maximum braking distance of such trains can be up to 2 kilometres. The maximum driving speed of passenger trains is currently 120 km/h but during the second half-year will be introduced new passenger trains driving up to 140 km/h. “These big numbers speak for themselves. While crossing railway you will win if you look, listen and are aware of approaching trains. You should understand that it does not make any sense to start competing with a train,” explained Vahemets. Anvar Salomets, Deputy Director General of the Estonian Technical Surveillance Authority, said that in recent years the number of railway accidents has stabilised whilst the number of collisions with road vehicles and fatalities has somewhat reduced. “There is still no reason to be satisfied with our railway safety performance – until there occurs even one accident or dies one person. The government and railway undertakings have done a lot for developing the technical infrastructure, which can now be deemed to be sufficiently safe. It still saddens us that the traffic behaviour of the general public has not developed with the same positive pace. In many cases railway accidents are caused by traffic regulation violations and negligence,” added Salomets. The railway safety week also includes presentations in schools, campaign posters placed in public space and a TV commercial. The key event of the week is the Golden Level Crossing Gates Award ceremony taking place on April 26. During this event are recognised the efforts of organisations and persons dealing with public railway safety. OLE (www.ole.ee) is a non-profit organisation founded in 2004 under the auspices of Estonian Railways. The mission of the organisation is to increase considerably public awareness about dangers present in railway transport and lawful behaviour on railways in order to reduce the number of railway accidents and persons killed or injured in course of such accidents.